The notion of organizational culture has become a matter of central importance with the great increase in the size of organizations in the twentieth century and the need for managers to run them. Like morale in the military, organizational culture is the great invisible force that decides the difference between success and failure and serves as the key to organizational change, productivity, effectiveness, control, innovation, and communication. Memory as a Moral Decision, provides a historical review of the literature on organizational culture. Its goal is to investigate the kind of world conceptualized by those who have described organizations and the kind of moral world they have in fact constructed, through its ideals and images, for the men and women who work in organizations.Feldman builds his analysis around a historically grounded concept of moral tradition. He demonstrates a central insight: when those who have written on organizational culture have addressed issues of ethics, they have ignored the past as a foundation to stabilize and maintain moral commitments. Instead, they have fluctuated between attempts to base ethics on executive rationality and attempts to escape the suffocating logic of rationalism. 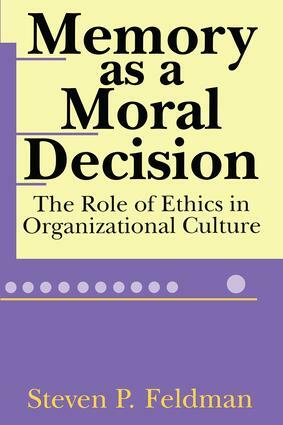 After an opening chapter defining the concept of moral tradition, Feldman focuses on early works on organizational management by Chester Barnard and Melville Dalton. These define the tension between ethical rationalism and ethical relativism. He then turns to contemporary frameworks, analyzing critical organizational theory and the "new institutionalism." In the final chapters, Feldman considers ethical relativism in contemporary thinking, including postmodern organization theory, the exaggerated drive for diversity, and such concepts as power/knowledge and deconstructionism.Memory as a Moral Decision is unique in its understanding of organizational culture as it relates to past, present, and future systems. Its interdisciplinary approach uses the insights of sociology, psychology, and culture studies to create an invaluable framework for the study of ethics in organizations.